"Hargraves Home and Hearth" has officially moved! 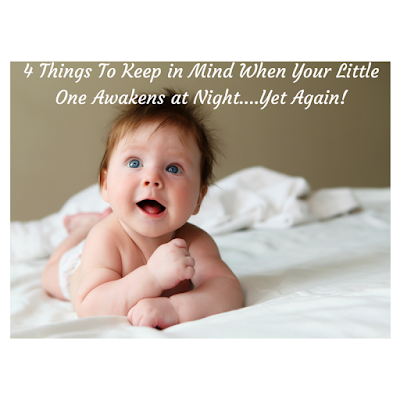 4 Things to Keep in Mind When Your Little One Awakens at Night....Yet Again! Sometimes inspiration for a blog post will come to me while taking a shower, or nursing my baby, or reading a great book, or making dinner, or when getting ready for me day. But the inspiration behind this particular one came to me one morning last week at 2am. Yes, you read that correctly-2am! What on earth was I doing up at 2am? Well, nursing my baby and wondering why she was awake in the middle of the night for the third night in a row! You see, from two months of age on, now 12 month old Anna has always been fantastic at sleeping through the night. Granted, she would have her nights sporadically here and there where she would awaken me and I would have to nurse her and put her back to bed. But by and large, we all began to enjoy a full night's rest in this house from the time she was about two months old. Suddenly Anna was waking me up each and every night for three nights in a row! And not just waking me up by crying for a second on the monitor and then going back to sleep. No, we're talking a continuous, becoming-more-insistent, "Mama, you need to come get me!" type of cry. Each night! So, I would get out of bed, put on my robe, walk across the hall, get her out of bed, change her diaper if I thought it needed it, nurse her, put her back to bed and 40 minutes to an hour after having gotten up, I would finally go back across the hall, climb into my own bed again, and go back to sleep. What was the deal? Why was my great sleeper suddenly waking me up each night? Didn't she know she was a good sleeper and understood the whole sleeping-through-the-night thing and needed to act like it? I still don't fully know why she had those days last week (happy update-this week has been back to normal pretty much!). One of the nights she was indeed wet, but the other nights I don't fully know what the problem was. She may have been unexpectedly hungry, may have had a bad dream, may have been unable to get comfortable, or may have just needed Mommy time. But as I sat there in my rocking chair in her nursery that morning at 2am, I pondered on the implications of being up with my daughter. I pondered on how, at times before when she would wake me up in the middle of the night, I would grumble and complain, roll out of bed angrily, get frustrated that I was losing sleep when my child was so not a newborn anymore and not sick, etc. so should not be having trouble sleeping, and reluctantly go feed her and tend to her (and then lament to my husband later about what a selfish, horrible mother I was for that attitude! Ever been there? ;) ). But yesterday morning was different. Because, in God's grace, four thoughts in particular suddenly went through my mind that hadn't fully stuck in the past during those nighttime feedings. Four lessons which encouraged me, which brought new and fresh and Biblical perspective, vision, and purpose to that moment, and which, I pray, will encourage you fellow Mamas who are right there with me in the trenches of those sleep-depriving middle-of-the-night feedings and baby-calming times. 1. Remember Those Ladies Who Would Give Anything to be Awakened in the Middle of the Night by a Crying Little One, and Ponder On How Very Blessed You Are! 2. Those Times with Your Children are Moments and Memories You Wouldn't Have Otherwise! 3. It Truly Won't be Like This for Long! There's a popular country song with this sentiment, and it is so true! As much as it felt sometimes like those newborn days of feedings every two to three hours around the clock would go on forever, I look back now and am shocked at how fast they flew by with Anna. Just when you feel like there is no light at the end of the tunnel or no return to continuous sleep all night long, you leave the tunnel and are amazed at how short it was! So, no matter what your cause for being "interrupted" yet again-a colicky baby, a teething baby, a baby who just needs snuggles, a baby who just needed a short cat nap, or what have you, it won't be like that for long! Remember that, embrace the moment, and soak it all up as much as you possibly can. Because, again, you'll blink and gone will be the days of interrupted sleep. 4. Your Little One Wants (and Needs) You! I understand how you feel, Mama. I know what it is like to just want to be able to stay in the comforting warmth of your own cozy bed, rather than up tending to your crying baby.....yet again! But may I encourage you today, friend? This time is special. It's precious. And it's fleeting. All too soon, it will be gone. So, savor it, by God's grace and through His strength. Because, while you can always get your full night's rest back again, you can't get this sweet time back again. Interview with Kristen Lisemby Lee of Where Joy Is Ministries! There is a brand new feature here on the blog that I am so excited to be launching today! 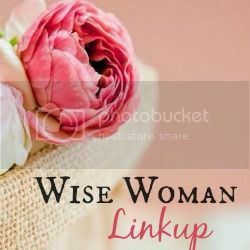 That new feature is a great new series of interviews with wonderful Christian women who are inspirational blog writers and who are running encouraging Christian ministries through their writing. I'm so excited about sharing with you all these ladies who have been an inspiration to me, and who I'm sure will be a blessing to you, as well! Today, the first lady we have the privilege of hearing and learning from is Kristen Lisemby Lee of Where Joy Is Ministries. Rather than telling you all about Kristen and her blog ministry, I'll just let her do that! So, grab a cup of tea, sit back, and enjoy as we learn from Mrs. Kristen Lee. 1. For those here who may have never been to your blog before, could you begin by introducing yourself to everyone, telling us a little about your family, when/how you became a Christian, etc.? I'm Kristen Lisemby Lee. I've been married for almost six years and I've been a mom for nearly five of those six years! 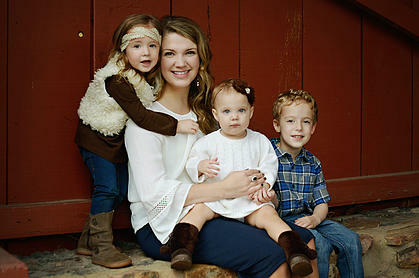 My husband, Grant, and I have three little ones now and we live in Arkansas, way out in the country. :) I was raised in a strong Christian family and came to know the Lord at the early age of 5. When I was 13 years old, I remember the Lord just convicting my heart to surrender my entire life to Him - all those areas we often don't think of. Thirteen was a big year for me where I just told the Lord that I wanted Him to direct my life; that I wanted Him to be not just my Savior, but my Lord and Master. 2. You blog at the lovely site, wherejoyis.com. Could you share with us what your passion and purpose is for that site? I've been blogging off and on for over 10 years but in 2013, after our second baby was born, I walked through a difficult season in my life. In that period, the Lord really ministered to my heart and let me to Psalm 16:11 which says, "in Thy presence is fulness of joy." I realized - in a completely new and personal way - that joy is always offered to us through the person of Jesus Christ. Joy is not based on circumstances, like happiness is. Joy is resting in the presence of God. I took that and titled my current blog/website Where Joy Is because I desperately need to be reminded that joy is always where Jesus is and I want others to be encouraged and comforted by that as well. 3. In addition to running a blog ministry for ladies, you are also a wife, a homeschooling Mama of 3 little ones ages four and under, and a homemaker. How do you find the time to do all that? When do you typically do your blog writing and that kind of thing? What does a typical "day in the life" look like for you? 4. You have a pretty exciting event coming up this spring. In April, you will be speaking at a weekend retreat for young women. With this heart that you have for young ladies and your desire to minister to them, if you could give just one piece of advice to today's young women, what would it be? I am VERY excited about this event in the spring. For years, I have wanted to put together a conference for young women and the Lord has finally opened the door and is making that happen. If I could give one piece of advice to today's young women, it would be to pursue Jesus with everything we have. We are all so very guilty of trying to fit God into our lives instead of basing our lives upon Him. Sometimes we think that because we are Christians, any decision we make automatically has His blessing and so we assume He's tagging along as we go about our day. We don't truly abide in Him. And because of that, we are easily frustrated and confused and discontent. I have to be reminded all the time that I can literally do nothing if Jesus is not my central focus. And so I think it's vitally important for us to understand that although we may be God's people, we MUST run hard after Jesus. We have to pursue Him, thank Him, and allow Him to direct each movement of our lives. 5. Your ministry also centers around wives and edifying and encouraging them. What is one piece of advice you would give to a newly married woman? What is one thing you would do differently if you could start your marriage all over again? One of the biggest pieces of advice I could give (and probably the one thing I would steer clear of if I were to start my marriage all over again) would be to not place your husband in the position of Jesus. As new wives (and maybe veteran wives as well! I don't know yet :) we have a tendency to rely on our husbands more than the Lord. Yes, our husband needs to be needed, but if we aren't careful we can put an overwhelming amount of pressure on him. They weren't created to bear all of our burdens, that's the Lord's job. I do this so often and I always suffer because of it. No man - no human being - can ever truly fulfill us or give us peace. If our man could do all that, we would have no need for Jesus. So don't expect your husband to be God. Don't make him an idol. It's so easy to do. 6. You clearly love being a Mama. What have you found, though, is one of the hardest things about motherhood and what has the Lord taught you through being a Mom? What advice would you give to a brand new Mama? The hardest thing, for me, about being a mom is the feeling of isolation. I'm not just a mama, I'm a stay-at-home mama, so I am with my children 24/7. That can get lonely and very, very exhausting on many different levels. So I would say to new moms - make time to refuel. It may mean just locking yourself in the bathroom with your Bible and a chocolate bar for a few minutes! But remember - you can't pour from an empty cup. I have learned since becoming a mother how utterly sinful and lazy I can be and how much I desperately need the power of God to nourish me each day. And what I have found that gives me the most help on the hardest and longest days is having the right perspective; allowing God to remind me that He entrusted these kids to ME, and what they will learn about Him and about salvation and about the Christian life will come from what they see and learn here at home. And there's no way for them to learn the right things if I am not allowing Him to work through me. 7. What are your favorite little things to do to make your house a home? Our home is never Pottery Barn magazine-worthy, but the goal is always for tidiness and order. :) There is often music playing and a candle lit. There may be toys scattered, but ultimately I try to make our house a place we WANT to be - somewhere peaceful and fun. 8. What hospitality tips could you share with us today? Growing up, my family didn't often have a lot of company whereas my husband's family always had guests coming over. Over the last few years, I have learned little tips about having company - little things like having snacks and drinks on hand, putting good smelling soap and lotions in the guest bathroom, and always wearing a smile and doing things that would make ME feel welcome if I were the guest. 9. What does your typical quiet time look like? What resources do you use and what are your favorites that you would recommend to other ladies? When you are a mommy, you go through different seasons of motherhood - small newborn babies tax your mind and body and leave you sleep deprived, toddlers are always loud and they frequently interrupt, preschoolers start dropping naps. So my quiet times come when I can seize the moment. Sometimes I'm up before the kiddos and I have it then. Other times, while they eat breakfast, I will read my Bible with my coffee. Most of the time, my most beneficial moments with the Lord have been during nap time and then the evenings when my kids are all in bed. I absolutely love my Streams in the Desert devotional and I use eSword all the time (via computer and app). Another thing I deeply love is the audio Bible on my phone. I can listen to God's word or various study plans while I'm driving or doing the dishes or getting ready in the morning. 10. What Christian resources for kids do you use and recommend to moms? We LOVE Scripture songs! We listen to the ABC Bible Memory Verse Songs CD by Mrs. Candace and the Sonbeam choir all the time. And recently we have fallen in love with the Bible Stories and Songs by the Wonder Kids. My oldest, Nathan, can recite several verses through these resources. We are also big fans of the Theo Presents DVD series. It's a fantastic collection of animated stories that teach doctrine on a child's level. 11. Who are some of your favorite authors and which books have you been impacted by the most? I love Elisabeth Elliot. Her wisdom and blunt truth is so convicting and inspiring to me. All of her books are fantastic. The Mission of Motherhood and the Ministry of Motherhood by Sally Clarkson are also two favorites. By far, the two most life-impacting books on my bookshelf have been IF by Amy Carmichael and Hind's Feet on High Places by Hannah Hurnard. 12. The name of your ministry is Where Joy Is Ministries. What are some practical tips you have for us when it comes to infusing joy into our everyday lives right where we are in this season? It's easy to lose your joy. David asked the Lord in the Psalms to restore the joy of his salvation to him. It's easy to grow weary and take our eyes off of Jesus and put them on our sorrows or troubles. Something that is helping me is remembering that I have been redeemed and forgiven. We take our salvation for granted sometimes and I have noticed that when I go about my day remembering the grace and love that has been poured out on me, I am more inclined to pursue His presence - and in His PRESENCE there is joy. 13. Are there any certain ministries or blogs you enjoy following? I always enjoy the devotionals and blogs from Set Apart Motherhood and Set Apart Girl by Leslie Ludy and I am an avid listener and reader of Revive Our Hearts by Nancy Leigh DeMoss. 14. What do you most want to be remembered for? My favorite poem/quote is by C.T. Studd which begins with the phrase, "Only one life, t'will soon be past. Only what's done for Christ will last." I want to be remembered as a woman who loved Jesus and whose life was wholly surrendered to Him. I want my children to see God's work and grace in my life and teach it to their children and their children's children. I want to leave behind a testimony that isn't full of compromise or spiritual apathy, but an obvious pursuit of what is eternal. 15. In addition to the young women's retreat coming up in the spring, are there any other exciting ministry projects coming up or ministry endeavors you are currently working on that you would like to share about? I have been working on a book for several years and I am hoping and praying to have it FINALLY finished in 2016! 16. If the readers today take away just one overarching lesson from this interview, what would you want it to be? Love and trust Jesus - especially in the moments that would be easy to be fearful or doubtful. Hold nothing back in your pursuit of Him. ​What's your favorite color? Blue - I love all shades but my ultimate favorite is sapphire blue. How do you take your coffee? Two packages of equal and some french vanilla creamer! What is your favorite way to spend a Saturday? Shopping, reading, and spending time as a family. What is your all-time favorite music to listen to? Anything that totally lifts up Christ. I love hymns and songs that are deep and rich in spiritual truth. Kristen, thank you so, so much for taking the time out of your busy life to share your heart with us! I know I have been encouraged and edified through your answers, and I think you have given all of us a lot to think about! Now I'm going to have to go look up those resources you mentioned! :) God bless! Ladies, by all means, go check out Kristen's blog, Where Joy Is! We Now Have a Facebook Group!!! 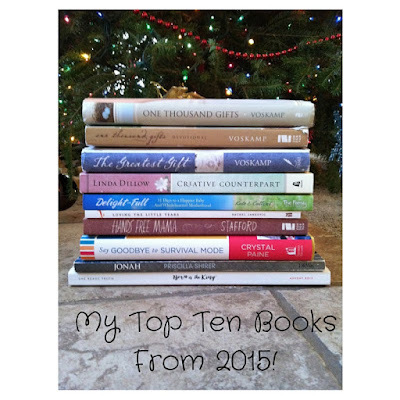 My Top 10 Books from 2015! If you know me, then you know that I am one voracious reader! I have loved reading as far back as I can remember, am well known for reading while brushing my teeth (gotta take full advantage of available reading time, right?? ;) ), and always read at least two or three books at once. 2015 was a year of some exceptionally fantastic book reading for me, and I am so excited to share with you today the top ten best books I read last year, which were such a blessing to me. So, here we go! This book was oh-so-good and oh-so-convicting, and I know that I already need to read through it again. I first got the book when Anna-who will be one next week! !-was only about a month old. It is all about coming to grasp with the detrimental affect our addiction to our phones, to technology, to social media, to perfectionism, to our to-do lists, etc. is having on our families and is depriving us of precious moments and memories with them. This book hurts your heart and then heals it all at once. Sadly, I know I need to read it again because of just how strong the pull can be everyday to things such as social media and the like as opposed to unplugging and instead getting down on the floor with my daughter and just playing and having fun with her. If you read one book this year on motherhood and proper priorities, have it be this one! So, so good. I would have to say that of all the books I read this year, even the great books in this list, One Thousand Gifts takes the cake and can be given the title of "The Best Ever Book I read in 2015"! It is that good. If you could snag a sneak peak inside my copy, you would find brackets after brackets, tons of underlining, stars, and notes upon notes on just about every page. No other book spoke quite as powerfully to me in 2015 as did this one. So, what is it about? Written by a woman who has struggled with so much sadness and trial at various times in her life, a past of panic attacks, and who is a worrier by nature, One Thousand Gifts is about slowing down, looking around, and finding the little gifts the Lord graces us with each and every day of our lives-no matter what we are currently going through. It addresses issues such as: How can I love, trust, and embrace a God who allows bad things to happen?, How can I enjoy life right where I am in this hard moment?, How do I slow down and savor the everyday?, Is God trustworthy?, Why does He allow bad things to happen if He is such a loving God and in control of all things?, and much more. If you are looking for some much-needed encouragement or simply some tools to fight worry and anxiety and busyness in your life, then look no further! Get this book! Today! It is a must-read for sure. It will change your life! This is the companion devotional to the book One Thousand Gifts and is such a great tool for infusing beauty, joy, and grace into your every day. While One Thousand Gifts itself is made up of full-length chapters, the devotional is comprised of 60 short 2-3 page devotionals with room to write prayers or to journal at the end of each one. This devotional would be the perfect tool for you to start each day off right! It contains snippets from One Thousand Gifts as well as completely new material, all designed to get your mind focused on the Lord and the goodness and beauty all around you each day. It is a great way to bring the truths of One Thousand Gifts fresh to your mind again, and to have it impact you day after day, long after you have finished reading the original book (though, really, One Thousand Gifts is one of those books which should be read at least once each year, I think!). 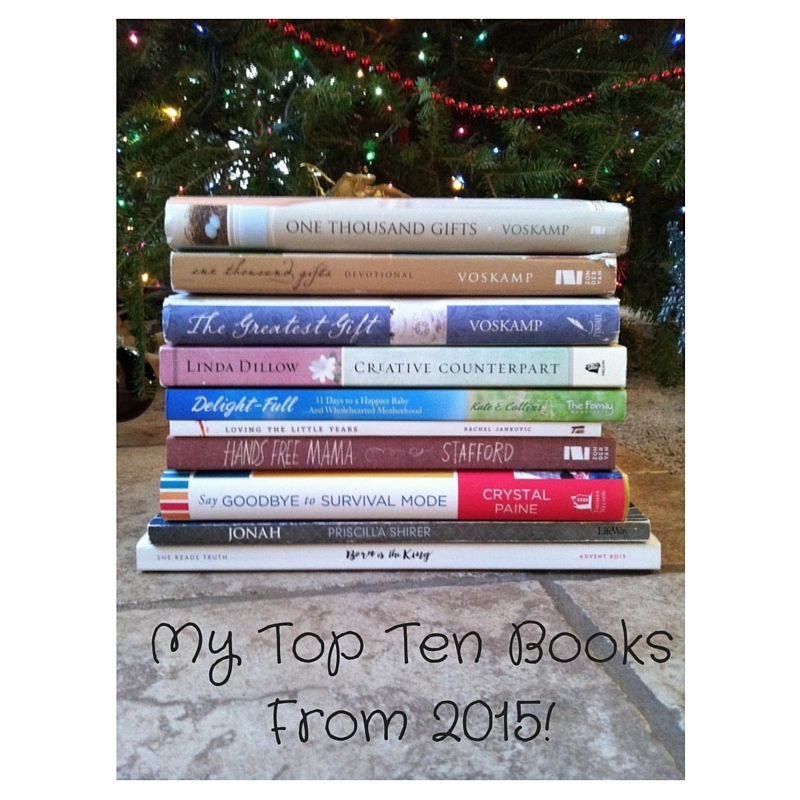 Can you see that I became a huge Ann Voskamp fan this year? ;) I read this gem of a book this Christmas season, and let me tell you-it blessed my socks off! It is compiled of a daily reading from the Bible, a 2-3 page devotional, a daily quote and daily action point, and three questions to contemplate, for each day starting December 1 and going through December 25. It shows how the story of Christmas started way back at the beginning, before Adam and Eve ever sinned, and how, even before the fall, the Lord had us on His mind and was forming a plan to come for us, rescue us, save us, and love us. It is so touching and eye-opening as it traces the story and plan of Advent down through the OT stories of Adam and Eve, Noah, Jonah, Abraham, Rahab, and others. It encourages us and equips us with practical ways to slow down, savor, and soak up each moment of the Christmas season, to let go of the need for perfection and pinterest-perfect Christmases, and puts our focus and perspective where it should be-on the Lord and how, through Him, we might serve those around us at Christmas time and always. By all means consider getting this book before December 2016 and reading through it this Christmas season! If you are familiar with the amazing, amazing (I literally cannot say enough good about it!) 2015 movie from Sherwood Pictures, War Room, then you are already familiar with fantastic Bible study teacher, Priscilla Shirer. She is the author of numerous books including the companion full-length book to the Jonah study, entitled Life Interrupted: Navigating the Unexpected. To be honest, I have not quite yet finished this Bible study, but since I did start it and read through the majority of it in 2015, I just had to include it in this list. Let's face it-life is unexpected sometimes and filled with wrenches thrown into our plans, unforeseen happenings, etc. If you are currently being unexpectedly faced with some new trial, tragedy, hard time, role, or priority that you did not plan for, then you need this book. Even if you are not currently finding yourself in that type of situation, you still would benefit from this great book, because your life may very well get interrupted in 2016! You will be greatly encouraged and given a fresh vision and perspective for this new plan the Lord has for your life. This book should be on the shelf of every Christian wife and mother, and is another one that I plan to read through again. It covers everything from the beauty of God's blueprint and plan for womanhood, what a Christian woman's priorities are to be and their proper order, how to be your husband's creative lover and greatest fan, and so, so much more. It also includes a Bible study and Bible reading plan in the back. Grab a copy of this book, ladies, and watch your marriage and family positively transform as you put into practice its Biblical principles! This is one of the books I read during those many middle-of-the-night feeding sessions way back when Anna was a newborn, and it is certainly one I will be returning to again and again throughout my mothering journey. It is comprised of 31 short essays, each with a recommended action point at the end. It covers topics such as savoring everything about your baby, talking to your baby, feathering your nest with love, filling your heart with peace, recording the moments of love and laughter, holding tight to your baby's hand and heart, being the best Mama God uniquely created you to be, and cultivating contentment. I believe it would be a great blessing and inspiration to any Mama's heart! This is another book I read during those many middle-of-the-night feeding sessions with newborn Anna, and is on my "to-read again and again" list, as well. It's a short little read of many quick, easy-to-read essays, but is bursting with an abundance of wisdom and godly perspective when it comes to motherhood and all its stretching, sometimes overwhelming, and yet wonderful responsibilities. Be refreshed and have your vision renewed as you read about being a gracious Mama, me time, cranky children, when characteristics your child is portraying sound off the alarm bells, how the fruits of the spirit apply to your parenting, and much more. This book definitely belongs on every Mama's shelf, as well. Written by a mama of -at the time- six little ones, it's a treasure from someone who knows what it's like to feel overwhelmed and to need encouragment as a Mama! This book should probably be at the top of your to-read list, as reading and implementing its wise, practical tips now will wonderfully transform the rest of your year! I read it back in November and am so glad I did, as it prepared, inspired, and drove me to have a productive, intentional 2016. It is chock-full of great, super helpful ways to determine what to say yes to and what to say no to in this new year, what your priorities ought to be and how to focus on them, how to make to-do lists and goals for your day, week, month, and year for every aspect of your life, how to stop trying to do it all by saying yes only to the best, how to be intentional with your bank account, manage the home front well, make a difference, and how to kick-start your success and not feel like a failure. I highly recommend it! Another thing I love about it is how Crystal shares with us her background story in it, how she has struggled with all of these issues herself, what she has learned, and how it has changed her life for the better. Super helpful for all wives and mamas, homemakers, bloggers, and home business owners, especially! This, along with The Greatest Gift, was a study I did with a friend of mine this Christmas, and I am so glad I did! Through the lives of several OT folks such as Adam, Abel, Abraham, Esther, and Jonah, it shows how each of those OT characters were foreshadowings of Christ and how He was the truer and better of each of those people. The final week in the 4 week study centers around the characteristics of Christ Himself, and all that He is for us. This was such an eye-opening study and brought such meaning to my Christmas in 2015. Highly, highly recommended! All of the daily readings from the 28 days are free at the She Reads Truth website and app, but there is also a workbook that can be purchased, too, which is what my friend and I chose to get. Definitely consider getting it for yourself for Christmas 2016! It will revolutionize how you view Christmas and Advent and will truly bless your December! Well, that is it, ladies! Those are the top ten books I read in 2015. :) I truly believe you would be greatly blessed through reading them for yourself, and highly encourage you to consider doing so! After having a baby, did you ever feel concern over how your body looked to your husband? Have you ever struggled with disdain for the appearance of your postpartum body? How to Homeschool Art - The post How to Homeschool Art appeared first on Kristi Clover.